Most Italian restaurants serve a basket of bread before the starters and main dish. To cater for the Indian taste buds most restaurants have chilli oil or chillis in olive oil served with the bread. For the not so chilli taste buds they serve a dip which I have been trying figure out what it contains. Not that its a big secret but most restaurants refuse to name the ingredients let alone hand out the recipe. The first time I had the dip at La Veranda in Mombasa, it tantalized my taste buds. Some would mislead us by saying oh there are too many things that are put together, one even mentioned corn. 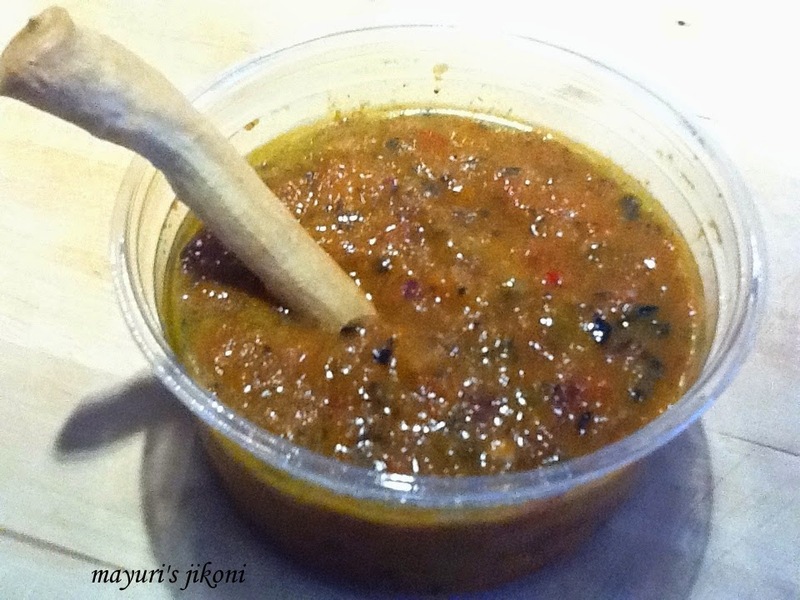 But finally I have figured out what it is….. its not just a dip but it is a sweet pepper pesto. I made some a few days ago to go with the home baked bread and thought to myself… its so easy and why why didn’t I figure out what the ingredients were long time ago. Oh well, I guess things happen when they are meant to happen… at the right moment. For a few days I think the pesto sauce is going to replace the green chutney on my bread. An excellent spread for sandwiches, nice dip for bread sticks, I even tried it on a normal chapatti and it tasted good. Cut the peppers into half. Remove the pith and seeds. Cut into chunks. Cut the onion into chunks. Place the sweet pepper and onion chunks , garlic and chillis in a baking tray. Add the olive oil, salt and pepper and mix well. Roast the pepper mixture for 20 to 25 minutes. Add the olives and process the mixture into a coarse paste in a food processor. Remove the pesto into a container. Add the vinegar and mix well. Add extra olive oil if you prefer. Can pan fry the peppers, onions, garlic, chilli in the olive oil instead of roasting them. Don’t use a vinegar substitute as it will not be as tasty. Use any other good vinegar. The pesto can e stored in the fridge for a week. Use a fresh red chilli if you like.